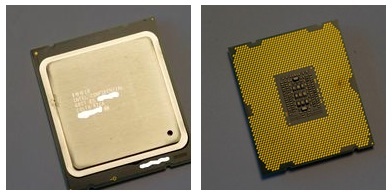 The Inquirer reports that Intel's Sandy Bridge E server chips, also known as the Xeon E5 series, are set to debut week. According to the report, the chips have been in the distribution channel for several weeks now, meaning that manufacturers utilizing the chips, as Apple would be expected to do in an updated Mac Pro, will be able to hit the ground running. Benchmarks are evidently still under embargo until next week, but the Xeon E5 chips will undoubtedly be a vast improvement over the chips found in the current Mac Pro, which hasn't been updated since mid-2010. Other companies such as Dell have already begun announcing new products based on the Xeon E5, meaning that Apple could be ready with Mac Pro updates in the relatively near future. Apple is likely to take advantage of the E5-2600 series 6-core and 8-core chips for its dual-processor Mac Pro configurations, while focusing on the E5-1600 series quad-core and 6-core chips for its lower-end single-processor models. Aside from the new processors, other pieces crucial for a blockbuster Mac Pro upgrade are also falling into place, although there have been few specific Mac Pro rumors in recent months. One recent report did claim, however, that Apple is planning to switch to NVIDIA graphics in the updated Mac Pro, moving away from current graphics partner AMD. An update to the Mac Pro is of course also contingent upon Apple deciding that it is worth keeping the line alive. The company late last year was reportedly "questioning" the future of the Mac Pro line, examining whether it should continue offering the professional-level workstation as sales have declined amid a continued shift toward notebook machines and specs that had gone stale while waiting for Intel to release updated processors. This seems far too much like real news. Its nice to see news about real computers. It almost feels like apple doesn't care about professionals and is instead focusing on the iOS toys. Just build a SB (or in a few months, IB) Hackintosh. Some people don't like worrying whether upgrades will make their machine useless. Oh please hurry. I rely on Macs with more than the 4 cores currently available on top end iMacs, and i'm not willing to buy a 2 year old machine at those prices! Plus i'm after Thunderbolt. I really hope Apple push the boat out with this update. But i have to admit to not expecting much. I know Mac Pros aren't exactly Apples bread and butter anymore, but it says something about their company that they're putting no effort into it at all by the look of it. If companies like Sony can sell products for everybody ranging from consumers to broadcast professionals and maintain high quality products throughout those ranges. then surely Apple can too. Maybe you wouldn't have to "question" the continuing existence of the Mac Pro line if you would supply your customers with an update more than once every two (and counting) years. Pro users want speed, and lots of it. You're not really delivering on your end of the bargain lately. Oh, and how about also ditching this Mac-only graphics card BS and figuring out a way of letting us put any standard PC graphics card in our Mac Pro? You're making a gazillion dollars on iOS devices now; you don't need to continue milking your pro customers with outdated graphics cards priced at a premium. Not going to happen with Ivy Bridge and integrated USB3 around the corner. Two technologies that Mac Pro customers won't be overly concerned with. Ivy Bridge is more of a player in the mobile space and USB 3 takes a back seat to Thunderbolt in storage speed and latency. I applaude this news; I really feel for the fans of the Mac Pro and Classic iPod--they've (I guess this includes me...) been left in limbo for quite some time!